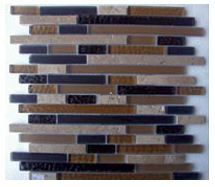 Give your home a bold makeover with the spectacular Glass Mosaica Civili Phoenicia mosaic tile. 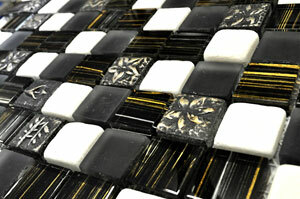 It features a brilliant design and consists of multiple stone and glass blocks in variations of black and white. 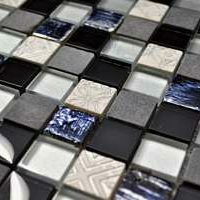 The Glass Mosaica Civili Phoenicia tile is available in a standard size of 300x300mm and is sold per piece. It is an indoor wall tile which is suitable for use in bathrooms, kitchens and laundry spaces. It can also be used to create wall borders in feature walls. This tile is all about bold and spectacular looks. It exhibits a decorative effect and is designed with multiple patterns in shades of white, black and gold. It offers a natural finish and will work great with most types of home décor and furnishings. Although available at an affordable price, it offers the characteristics of a top-grade product. This tile is manufactured to the highest standards and it is built to last you many years to come. And, thanks to special design, it will retain its attractive looks even after several years. 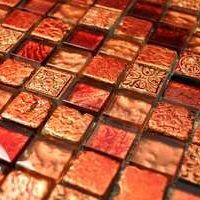 For a bold mosaic tile in Perth, you’ll find nothing better that the Glass Mosaica Civili Phoenicia at Ross’s Discount Home Centre. Buy this spectacular tile at the great price today from our online store!